Two summers ago we traveled as a family to Australia, where we were based in Canberra for five weeks. This month we are in Germany, based in Freiburg. We love to travel, but since having kids, we’ve noticed that travel has become a lot more expensive. Nothing illustrates this more than our grocery bill. We always have to stock a kitchen when we arrive in a new town. In Canberra, it cost us AUD245 in June 2011. In Freiburg in June 2013, our bill was EUR62. This is the case even though we also have one more kid this time, and little AP’s diet is pretty strict (and her favorite food, avocados, is hardly a local product). One Starbucks breakfast in Sydney cost us AUD28: that’s one tea, one long black, one yogurt, and three pastries. Our dinner last night at Hausbrauerei Feierling cost us EUR23: that’s one large fresh organic beer, one fresh-pressed organic apple cider, one bitter lemon, one large fresh soft pretzel, a basket of very good bread, two Landjäger, two Weißwürste, two Bauernwürste, and a salad. This is at a biergarten, yes, but it’s the most touristy one in Freiburg and the food was very good. Now in U.S. dollar terms, some of the comparisons might be overstating things. The $ / AUD exchange rate was about 1.2/1 in 2011, which was as bad as it’s been. The $ / EUR exchange rate right now is around 1.3/1, which is great by recent standards. Also, when it comes to stocking our kitchen, we had to be more aggressive in Canberra because we couldn’t walk to the Supabarn, whereas we can walk to the Rewe in about 7 minutes. But those differences don’t begin to explain the stark differences in the price of food between Freiburg and Canberra. Moreover, these inexpensive foods that we’re buying here in Freiburg are tasty and nutritious. If you don’t believe me, take a look at this fried egg, which is just a normal organic cage free egg from the grocery store. 10 of these cost EUR1! Subsidies in the U.S. seem to be producing huge amounts of grains, leading to a superabundance of white flour, corn syrup, and corn-fed beef. Here, they seem to be producing nutritious, locally-grown, organic vegetables, tasty dairy, cage free poultry, and free range meat. I see two questions here. One is why food is so expensive in Australia but so cheap here. One might think it’s just about subsidies—Australian farm subsidies appear to be very low—but don’t forget that Australia is a big sunny country with no one living in it, and (especially in Queensland) the land is incredibly fertile. Even with low subsidies, and a center which is useless for commercial agriculture, Australia is a net agricultural exporter. Agricultural subsidies in Germany are a big deal, and farmers are very powerful, yet this does not translate into either higher food prices or an abundance of lousy and unhealthy food. Which leads us to the second question: why, given the extensive subsidies to German farmers, does this not translate into industrial farms producing bland and unhealthy corn/wheat/soy by the kiloton? The most productive farm areas of Germany would produce approximately the same types of crops as would the most productive farm areas of the U.S. Yet farmers are growing a wide range of healthy, natural foods, and for the same price. I’ve asked around a bit, and I have some hypotheses. But none seem satisfactory. The “Freiburg” Effect. It’s possible that our experience is not a German experience, it’s a Freiburg experience. Freiburg is a very environmental town, and numerous people have explained to us that French culinary traditions shape Freiburgers’ approach to food. Maybe if we were elsewhere in Germany, we’d see fresh produce, dairy, and meats with the high prices that we expect. It’s possible that this is true, as neither JMP nor I have been anywhere else in Germany than Freiburg. But we doubt it: Germany is a capitalist economy with incredibly functional domestic transportation system, so it’d be hard to imagine that prices would differ that much in one city because competition would tend to equalize them. (Also, Freiburg is very close to France, so it should also experience competition from there as well.) This would probably only work as an explanation if the premium on local agriculture elsewhere were so high as to make it impossible to sell Freiburg’s local agricultural products elsewhere at nearly any price. EU Agricultural Subsidies. It’s also possible that EU agricultural subsidies just really work well, and that the low prices for food are just the consequence of high taxes, which we as tourists don’t see. Could be, but that doesn’t seem quite right, for one reason. German agricultural policy is made in Brussels, and we’ve been elsewhere in Europe (France, Italy, the UK) around this time of year, and seen tasty and nutritious food, but the prices were much higher prices. Farm size. One economist explained to me that German farms in what was formerly West Germany tend to be small. This creates stiff price competition, and inhibits mass production of cheap grain on an industrial scale. The former seems exactly wrong to me: small farms should be less cost-efficient, on average, than large ones. But there is perhaps something to the second argument. One piece of evidence in favor of this argument might lie in the large farms in the former East Germany, which are large as a legacy of collectivization under the GDR. Perhaps they act more like U.S.-style industrial farms, leaving the smaller farms in the former West producing other types of agricultural products that just happen to be better. But still, this does not explain why oranges (from Spain) and avocados (from Peru) are still so inexpensive. In all, we’re stumped. But happily so: eating well and feeling healthy without breaking the bank. And it makes me wonder how agricultural subsidies here are working so well, given their incredibly distortionary effects on food production in the U.S.
Could you translate the money to dollars so we can see the comparison? Oh, sure. In July 2011 AUD 245 was about $265. Today, 62 Euros is about $81. Glad to hear you like it in Freiburg. However, the eggs you bought are not certified organic, only from free ranging chicken. It’s only a small difference though. “True” organic is about double the price. First, price competition of German supermarkets is extremely tough. Especially when it comes to staple foods like milk, eggs, butter, customers have an easy time comparing prices and will do that. For that reason even comparably “high class” supermarkets such as rewe have to compete. Second, there are a lot of mass production farms which produce – at least in comparison to “true organic” sometimes bland meat products, Niedersachsen is especially known for that. If you go to a “Füllhorn” or “Allnatura”Organic supermarket you’ll see the real price of organic meat. While a whole chicken is somewhere between 2 and 6EUR non-organic and “mass produced” to differing degrees, the same thing will be about 20EUR in organic. There is a slow change in consumer awareness, but generally I think that the low prices in Germany are a testament to consumer frugality more than anything else. Meat in France, e.g. is considerably better on average but also more expensive. Thanks for reading and commenting, Philip. Especially thanks for catching the difference between organic and cage-free (updated). We have yet to go to either Alnatura or Fullhorn, but we take your word for it that it would cost more. (I can’t find meats or poultry prices for either). I have to admit that I don’t understand why frugality would explain low prices in Germany. Americans are incredibly frugal too, and we have incredibly cheap food. It’s just all processed food which isn’t good for you. 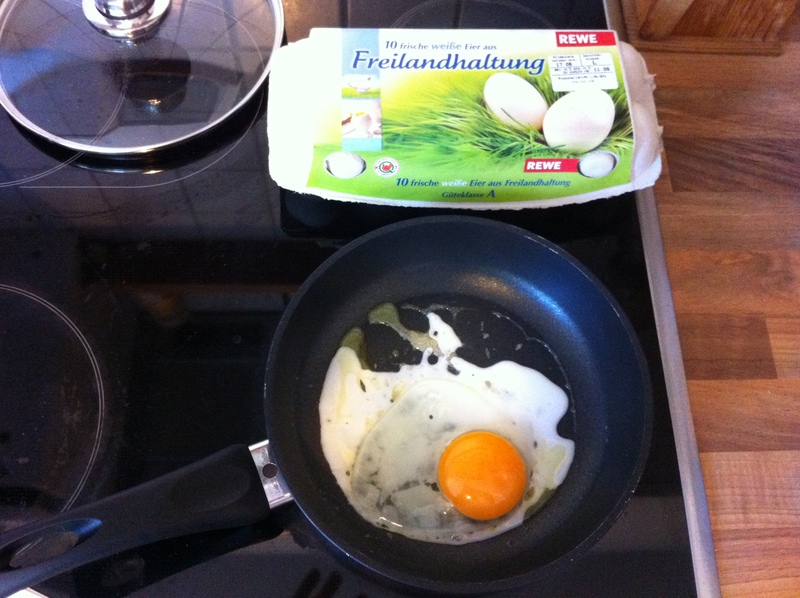 Even if the eggs are free range but not organic it is much cheaper than Australia. In Australia the a dozen of free range eggs cost no less than $4 AUD.